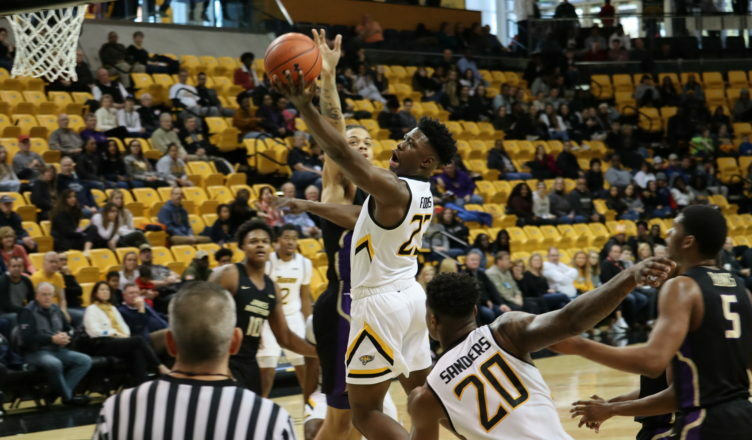 Towson kicked off its three-game homestand with a victory against James Madison in a Colonial Athletic Association (CAA) matchup Saturday afternoon at SECU Arena. Junior guard Brian Fobbs was extremely efficient with 29 points on 11-of-15 shooting to lead the team on the offensive end in the 66-59 win. Fobbs has scored at least 20 points in three of the last four games for the Tigers (9-16, 5-7 CAA). Towson was on fire from the field, shooting 51.1 percent for the game and 57.7 percent in the second half while outscoring the Dukes (10-15, 3-9 CAA) 40-29 after halftime. This marks the second time in the last three games the Tigers have made at least half their shots. Towson’s offensive performance was solid, but the team’s suffocating defense secured the win..
Towson held James Madison to 39.3 percent shooting, marking back-to-back games holding an opponent under 40 percent shooting. Dukes redshirt junior guard Stuckey Mosley caught fire with a trio of made three-pointers in the first half before getting shut down by the Tigers. Towson held Stuckey to only 14 points while shooting 5-of-18 from the field and 4-of-12 from three. Towson was able to hold the Dukes scoreless for over seven minutes during a stretch between both halves. Next, Towson’s homestand continues as the Tigers host Delaware on Thursday, Feb. 14 at 7 p.m. and Drexel on Saturday, Feb. 16 at 1 p.m. at SECU Arena. Saturday’s game is the team’s annual Autism Awareness game.